Photo taken: March 2011, Mumbai, Maharashtra. 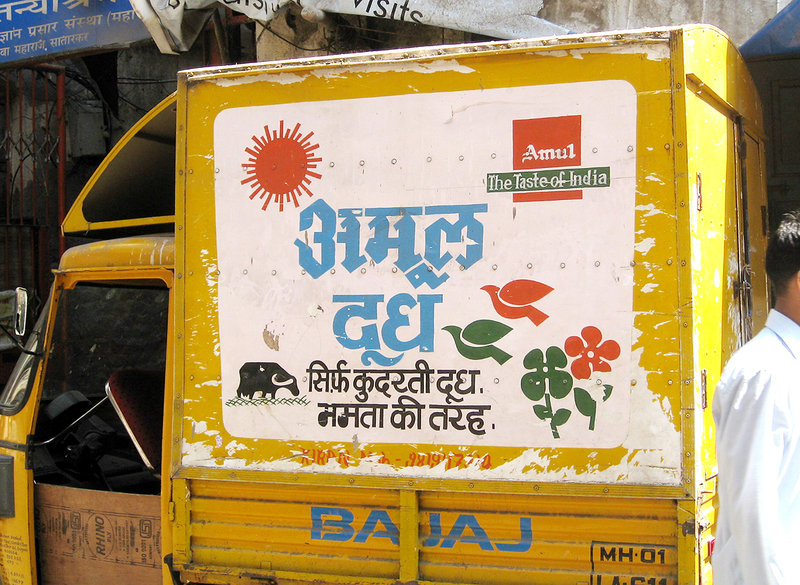 Here’s the famous Amul diary company’s blackletter-style logo, in Devanagari script, painted on a delivery truck in Mumbai. Some of my colleagues have posted images of the Amul logo in Gujarati and Kannada scripts. Namaste!! Congratulations for your achievements with Indian typeface designs. Its very beautiful collection of Indian typefaces and I am inspired here after going through the presentation made by you. Please have a glimpse at my blog where I posted few things on the subject. I request your critical review on this in order to keep my interest growing in the subject of typography, calligraphy and hand lettering. Basically I am an Engineer, but love the area of typography. Hope you will visit my blog and bless with your critical reviews. Nice to visit your blog. All the best!